The season of pure pleasure. 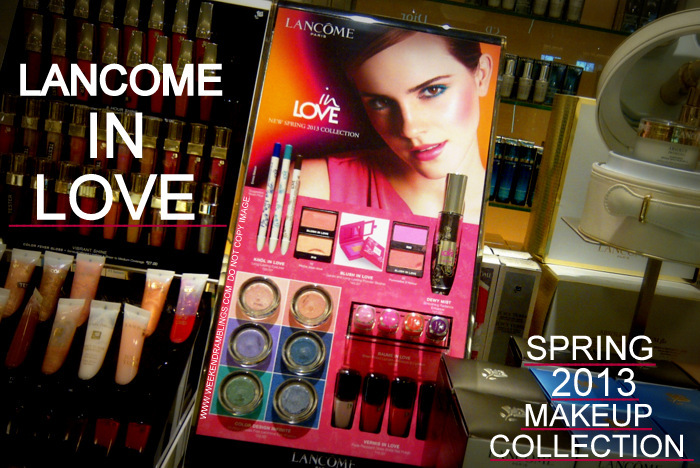 Lancôme captures the colorful wave of spring with easy to wear hues for all skin tones in the new Lancome In Love collection for spring 2013. The colors features are all beautiful brights - fresh pink and peach blushes, bright blue and green eyeliners, and barely there whispers of colour in the new Baume in Love for the lips. 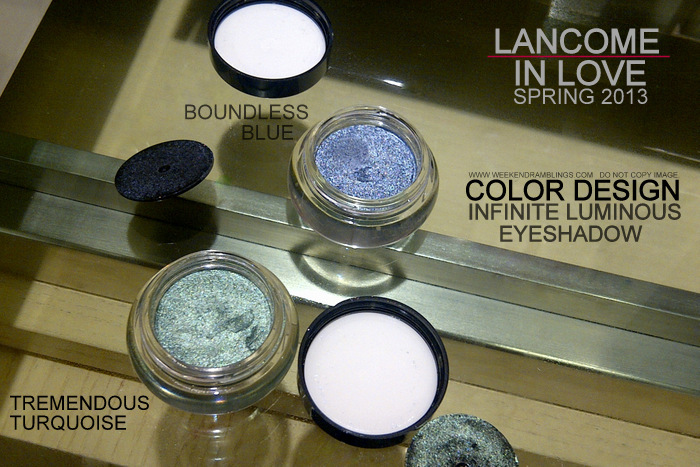 Color Design Infinite Luminous Eyeshadow - Boundless Blue, Evermore Lilac, Persistent Peach, Tremendous Turquoise. 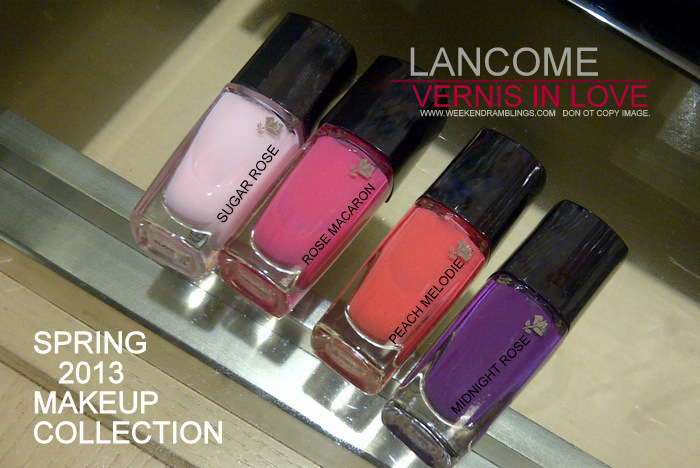 Vernis in Love Nail Polish - Sugar Rose, Rose Macaron, and Peach Melodie. 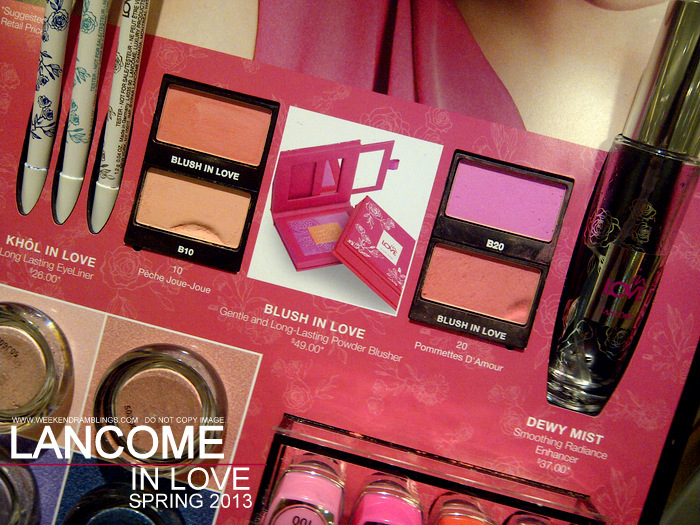 Blush in Love - Pommettes d'Amour and Peche Joue-Joue. Kohl in Love Eyeliner Pencil - Chocolate Affair, Deepwater Blue, and Jade Crush. 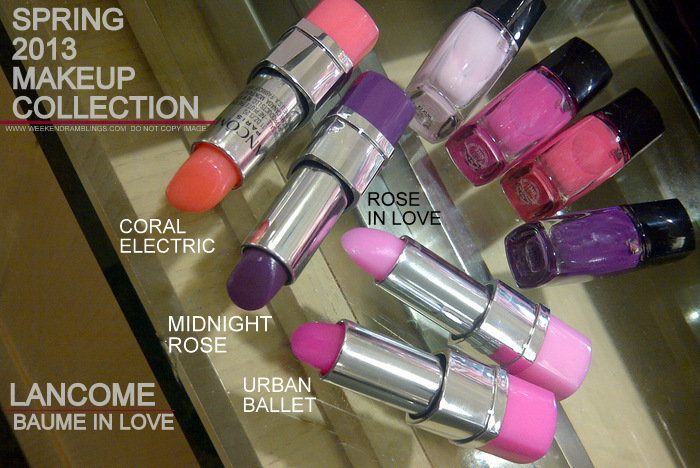 Baume in Love Lip Color - Coral Electric, Urban Ballet, Rose in Love, Midnight Rose. Dewy Mist - Setting/prepping spray that moisturizes and revitalizes skin. Blush In Love - There is a lighter and a darker shade in the same blush. 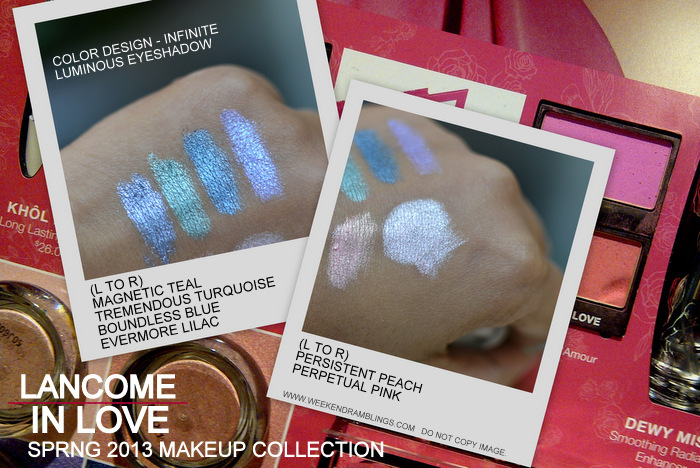 Color Design Infinite Luminous Eyeshadow - SwatchesMagnetic Teal and Perpetual Pink are not part of this collection. Baume In Love Lip ColorThese had barely any color at least with swatches on my hand - sort of like lightly tinted lip balms. Midnight Rose is not a part of this collection. 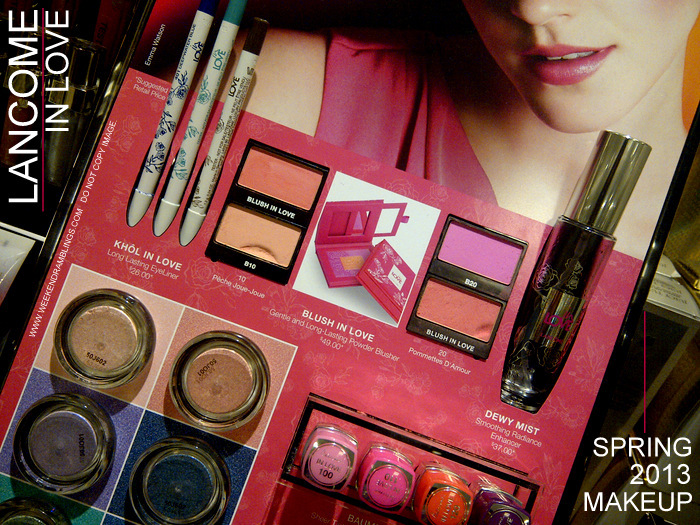 The Lancome In Love Spring 2013 makeup collection is currently available at Nordstrom online and in stores. Links provided for information only and are NOT affiliate links. Thou there is no particular reason for d mixing up.. It looks pretttttyyyy.. U got any? I think that's what I was thinking - the two colors look so pretty together don't they..and then I remembered I had to stop playing and get back home :P :D :D Naaaaaaah..I didn't pick up anything. The blushes were the only things I was interested in, and they turned out wayy too ashy on my skin. I didn't really find this collection too interesting. Correct me if I'm wrong but all the colours seem better suited to pale to medium skin tones not for tan, olive and dark. I went on the hunt for the Jade Crush as I must have it, own many of this family but I can tell this will be perfect just by how it is on you. As far as the persistent peach shadow, what are your thoughts. Lise Watier is releasing souffle shadows and I have a sample of the peach, also have the peach in loose shadow (dont use much as I dont prefer loose. Is there anything special about the shadow, only thing I can say about the new LW first impression is its pretty shiny, I have some age so ? Anyway dont have a lot of time if I order two products will get a bonus, starting to think so what, like I need it. anyaway if you can let me know.